Most people probably assume that postage is an expense that isn’t exactly controllable by the folks doing the mailing. After all, it’s not exactly as if you can walk into the post office and negotiate with the postmaster as to how much you’re going to pay to have your letter or package shipped. While there are certainly some elements that aren’t negotiable, there are in fact some ways that folks can save on postage and shipping. This is especially important to small business owners, as postage and shipping costs can account for a major annual expense. What follows is an in-depth look at 9 possible ways your small business can save on postage. There’s a good chance that not every recommendation that follows will make sense for your organization, but there’s a wide variety of suggestions here, and most small businesses can probably benefit from at least one of these tips. 1. Get the SendPro solution from Pitney Bowes. The best tip on how to save on postage on the whole list! The SendPro solution from Pitney Bowes allows organizations to efficiently manage their shipping needs through the use of a single-portal, intuitive interface, AND get the best discounts from USPS. Users are able to match the appropriate sending choice with the specific project, print shipping labels, track shipped items and use a number of other tools to control and manage their shipping expenses. Want to see how much you could save? Check out this savings calculator. Here’s a more in-depth look at how all of that works. The software comes with a built in address book so you’ll only have to enter frequent recipient information once. The SendPro solution from Pitney Bowes also comes with an integrated printer and scale, so you can print carrier-specific labels (USPS, FedEx, UPS) complete with IMpb barcodes. These IMpb barcodes qualify your business for reduced-rate commercial pricing, adding even more ways for your operation to save on postage. Regardless of the carrier you choose, the tracking numbers will work with the SendPro solution and the system will automatically email recipients when an item is shipped, provide up-to-the-minute tracking and allow you to track packages from PCs, tablets and smartphones. The SendPro solution from Pitney Bowes really shines in its ability to help small businesses track and manage their shipping expenses, vital steps in the goal of saving on postage. The software will allow users to import billing information into its existing accounting software, track costs in multiple ways (by client, user or department) and more easily send invoices to clients that cover their own shipping costs. This consolidated data will allow you to have a better understanding of your shipping operation and make adjustments as needed. 2. Make sure your addresses are correct! This is a big one. UPS and FedEx normally charge $10 or more if you make an error when you initially address your package and need to change it. The SendPro solution from Pitney Bowes eliminates the likelihood of that mistake because it keeps all of your frequently used addresses in one central database. That means, you can update an address once and it’s always correct no matter which carrier you use. 3. Use a postage meter. Lease a scale by itself through any number of providers. Again, the savings here comes by way of eliminating overpaying for postage, and in most cases the meter will print the postage directly on the envelope or package, so, no need for stamps! According to Pitney Bowes, businesses that regularly use postage meters can save as much as 20% annually on shipping. 4. Use bulk mail when it makes sense. If your small business sends a lot of first class mail and advertising material it might make sense to ship it via bulk mailing service in order to save on postage. Using bulk mail requires a permit, so check with your local post office about costs and mail preparation to see if bulk mailing makes sense for your business. 5. Use boxes and envelopes provided by the post office. If your business mails a lot of items via priority mail, it totally makes sense to use the boxes and envelopes provided by the post office to save on postage. Just keep an eye on the weight. If the weight of that free post office box bumps your package into the next weight category you might end up paying more to ship it than if you purchase a box on your own and ship it priority mail. 6. 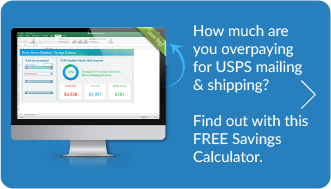 Work with the shipping service provider to minimize carrier fees. Most major shipping providers (USPS, UPS, FedEx) will have small-business specialists who can work directly with your company to save on postage, making sure the services you’re using and the associated fees make sense. A common discussion topic is when a small business should use ground shipping vs. air. When you use SendPro, you can easily compare the cost of all possible shipping methods and pick the most economical way to get your package there on time. Find out more about how SendPro can streamline your company’s mailing & shipping with this helpful guide: Shipping Simplified. 7. Avoid sending mail altogether. It may seem obvious, but there’s no sense in paying to ship a document if it can just as easily be sent via email. Even documents requiring signatures can easily be printed, signed, scanned and emailed to recipients. Talk about an easy way to save on postage! 8. Consolidate to save on postage. If your small business ships bulkier items (say, 150 pounds or more) you should consider looking into a consolidation service to help save on postage. These services will combine your freight with other shipments until they get a full truck. The savings are passed down to all of the businesses with items on that truck and it’s much cheaper to ship a full truck than one that is only partially filled. Work with your carrier directly to identify areas where you can save on postage, including any service lapses on their part. Your customers can also be a good source of feedback for how effective your carrier is. If your customers are unhappy with the shipper you’ve chosen, then what exactly are you paying for? Hopefully, you’ve found at least one way to save on postage for your small business. While shipping is a necessary expense, it doesn’t have to be one that’s set in stone.